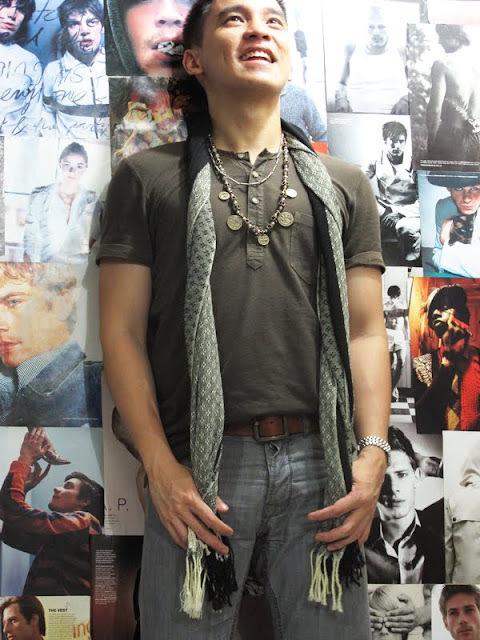 He likes wearing ties, scarves, cardigans and accessories that men do not typically wear. He blogs as an extension of his love for writing. He enjoys fashion, as he enjoys coffee, long walks and beautiful things. 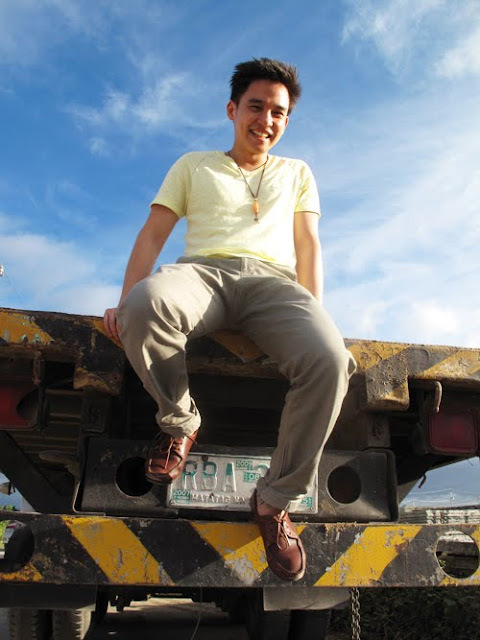 He may not be your typical fashion blogger or style person, but with his boyish smile, surprising and unconventional (often paradoxical) way of dressing will surely capture your attention. 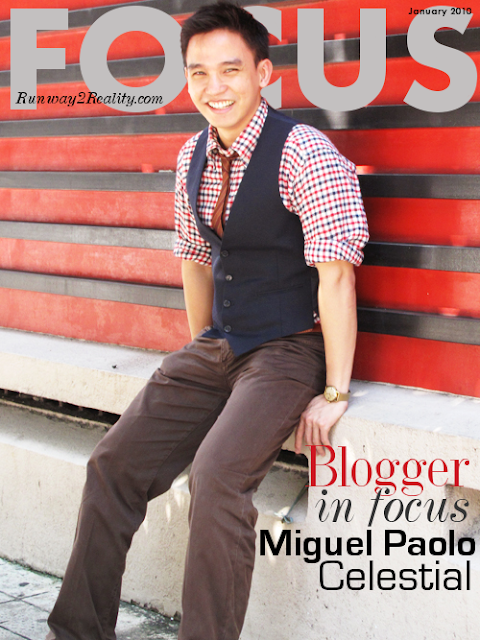 Runway2Reality interviews fashion blogger, Miguel Paolo Celestial. He will tell us about his personal style, love for writing, his recent venture in accessories design and how he disregards advice from others. Tell us about your background, profession and passion. Finished a graduate degree of Management Engineering with a minor in English Literature from Ateneo de Manila University. Currently work at the Manila office of the Financial Times, based in the UK. Also contribute for West East magazine, based in HK. 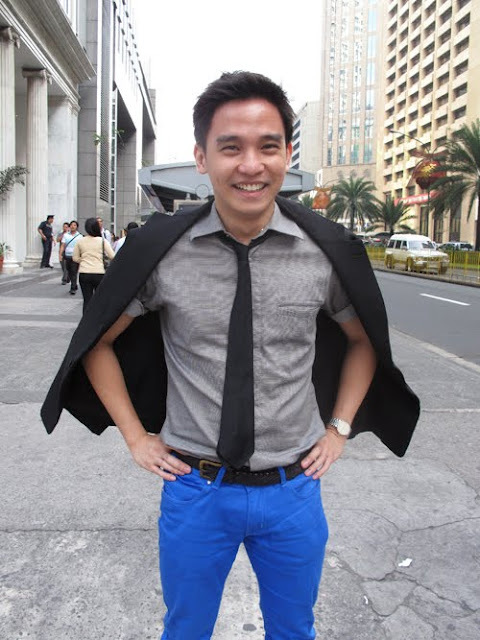 Was founding contributing editor of Garage magazine, also contributed to Rogue and The Philippine Star, YStyle section. My employment history has included the banking, government, publishing, advertising, and fashion sectors. My style is still basically preppy with all sorts of influences, like punk, street, and glam mixed in. It's hard to explain. Basically I do what feels right. I like wearing ties, scarves, and cardigans, but I also like wearing accessories that men do not typically wear. (I do not use pocket squares, but I wear necklaces made of semi-precious stones.) I do not have any specific style influences, but I try to keep up with what's out there so the zeitgeist is in my system. Then at the beginning of the day, when I sift through my moods and decide on what I feel, I pick out what seems appropriate. I try to keep it simple and subdued, with certain fashion flourishes known only to myself or close observers. Though of course when I want to have fun, I don't really care. Can you tell us about your blog. How and why did you start blogging? How long you've been blogging? I've been blogging on my menswear blog, El Bosquejo, for close to 1 1/2 years. I started it because I discovered at a late stage that I loved fashion and that I had something to say about it. It is a blog about ideas - so while I talk about fashion shows, my outfits, new clothes and accessories, models, designers, editorials, and streetstyle, I also talk about topics such as men wearing skirts, hedonism, art, literature, movies, etc. It is a draft ("Bosquejo" is the Spanish word for draft, sketch) written in white heat on all sorts of things. Sometimes I write about personal things, but I do that rarely. I blog because I enjoy writing about things. I enjoy fashion, as I enjoy coffee, long walks, and beautifully made things. I also blog on Manila streetstyle at La Folie Douce (lafoliedouce.blogspot.com), which is barely a year old. I started that page in the belief that style is universal. One merely has to look closely. Of course, it is also my way of appreciating women's fashion, which I seldom write about on El Bosquejo - except of course during the blog's early days (when it was not strictly a menswear blog), when I wrote about Charlotte Rampling, Maggie Cheung, Charlotte Gainsbourg, Franca Sozzani, etc. As I've said, the blog is about ideas. I feel that anything out there is just a suggestion, a proposition, an interpretation - from runway shows and magazine editorials to personal style on the streets. Change happens so fast in the fashion industry, but I do not feel compelled to go with its pace since things only repeat, are recycled, re-envisioned. I like that in this way the blog is abstract, not fixed. It breathes with me. Men's style in varying forms: fashion, art, literature, cinema, etc according to my interpretation. My blog is about ideas. Name the top 5 blogs that you follow. I can't say I follow some blogs more than others, since they're all loaded in my reader and I scroll down all of them. Though I may have to make a point of continuously expanding my list. When it comes to fashion and style, what inspires you the most? Sincerity. No matter how gaudy, shocking, or offensive something is, if it suits you and shows that it is your personality - and not some hackneyed image - that you are projecting, then I am impressed. I am hooked. I listen. People like that inspire me the most. Yeah, people inspire me the most. Ukay is not a secret. I've largely disregarded advice from others. Tell us about Bosquejo. The brand, collections, your vision and inspiration for each collection. I started making jewelry out of the frustration of not finding suitable necklaces for myself in the market. As of the moment, I have five collections on my Facebook page (facebook.com/bosquejo): Hardware, Djinn, Sand, Sacre, and Feline. I used the same name as my menswear blog not only for name recall, but because my methods in creating jewelry also involve ideas. Bosquejo (the accessories label) is about materials. For the Hardware line, I use little industrial objects like bobbins, hinges, cable connectors, nuts, etc. and join them with intricate beads to present the objects in a different light. For Djinn, I combine black and dark-colored stones (onyx, obsidian, "meteorite"), black pearls, hematite, and wood painted black. For Sand, I use shells and wood with transparent and opaque white stones (white jade, white jasper, moonstone, howlite), crystal, plastic, and pearls. For Sacre, I use religious and pagan medallions and join them with steel and brass beads. For Feline, the latest collection, I use red, orange, and yellow-colored stones (tiger's eye, agate, yellow jade, cat's eye, carnelian, etc). I like the idea of presenting materials in a different light. The next collection I will be doing will be named Nunca, and it will be all in white. 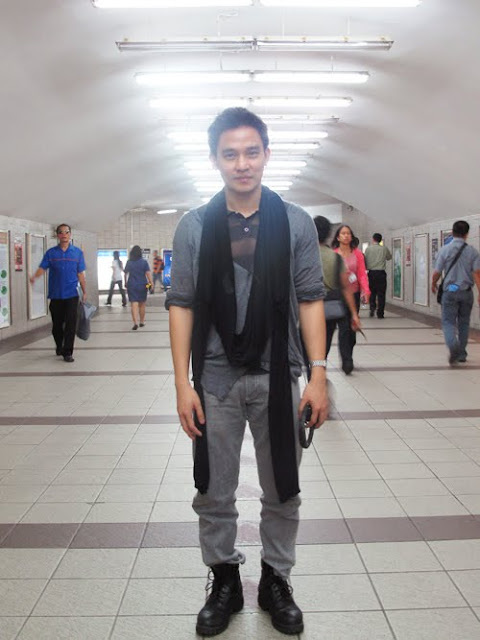 As in my menswear blog, I want to create pieces that are subtle and subdued. Only the owners of the pieces know what materials were used, and only upon closer inspection will others discover unexpected surprises. Did you study accessories design? How and why did you start? I intend to take a course, though I have no solid plans yet. My only background is production and costume design for the theater way back in high school. I started just making stuff for myself and discovered that people liked them. I do it for the love of materials. Can you name personalities or celebs that best fits a Bosquejo accessory? I've been told that the Sacre medallion necklaces have the vintage feel suitable for celebrities like Winona Rider or Keira Knightley. Locally that would be Angel Jacob. Guess what? A friend of hers bought her a Sacre piece as a gift, but I think she has yet to receive it. I don't think there are any limits really, on who can wear Bosquejo accessories. The pieces from the collections are different enough to be rendered wearable by different people. If it calls out to you, you'll know.